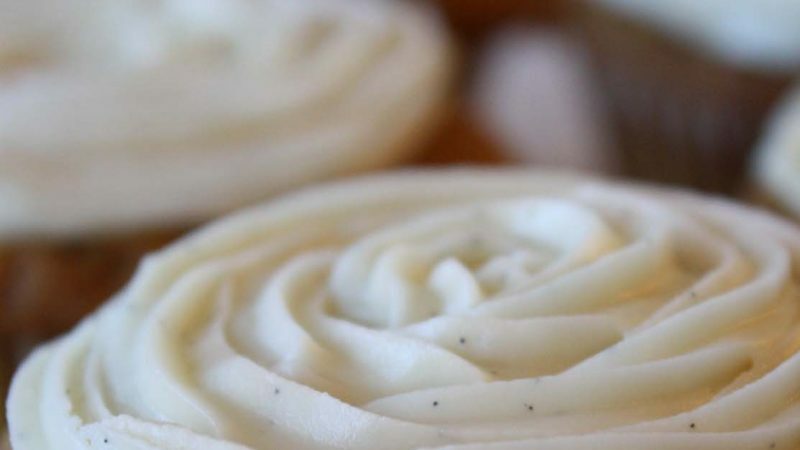 These cupcakes are moist and rich with vanilla flavor that is unlike anything else. This recipe is adapted from a Martha Stewart Classic, but with Rodelle’s spin on it. Optional: Replace 2 sticks of butter with cream cheese. In a saucepan, melt the butter over medium-low heat and continue to cook, swirling occasionally, until butter turns golden brown. Skim foam from top, remove from heat, pour into bowl and let cool. Place egg whites, salt and sugar in a large mixing bowl, whisk thoroughly. Place egg white mixture in a double boiler and heat water to a simmer on LOW to just warm the egg whites (the small amount of indirect warmth from the water underneath will help dissolve the sugar while NOT cooking the eggs). Heat until sugar is dissolved, about 3-5 minutes. Set egg white mixture aside and let cool. With the paddle attachment on an electric mixer, cream butter on medium until creamy. Slowly add the egg white mixture ½ cup at a time, scraping down sides as needed. Change to the whisk attachment and whisk for 2-3 minutes until creamy and well incorporated. Add powdered sugar 1 cup at a time, mixing on medium and then high in between. Mix on high for 1-2 minutes until frosting is light and fluffy. If the frosting is too heavy, add additional powdered sugar (1/4 cup at a time) until fluffy.